Our primary business at YKeeg is fun and games. In the land of Rimmoria, the cranky B. B. Snatcher has awoken from his nap and craves one thing. Baby Droolie's collection of pacifiers. Older siblings Chuckle Head and Blondie can't let the crying go on a moment longer and set out to recapture the pacifiers, but they'll have to face the wild imagination of Snatcher if they hope to collect all five colors. Fire the evil little guy across the ocean floor, avoiding seaweed beds and fish hooks. 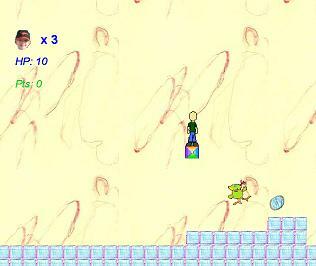 Along the way jellyfish will jolt plankton even closer to your target at the end. Games and software made with the open source, DirectX game creator "Construct."